In the four weeks since this blog was last updated, I’ve seen at least 80 episodes of anime! Not bad, eh? But to write anything of decent length, more than ever, I need to feel like what I’m writing about is really worth your time. That isn’t to say everything airing right now is poor, but how much of it is good enough to be remembered in years to come, particularly outside of their respective genres? For example, I love every minute of Cross Game, while the recently finished Shin Mazinger Shougeki! Z-Hen was fun and exciting, but what else is there that’s left to say about them? The former is sports anime, the latter is super-robot/mecha; there is literally nothing left to add that hasn’t already been written a million times over. If you’ve seen Touch, you’ve basically seen Cross Game. Anime sticks so rigidly to its genre tropes that after a few years of watching, it feels ever so slightly repetitive; not that these series aren’t fun to watch, because they are, but to think about? To write about? Not so much. Not after 3 years of blogging. Yet the impetus for this post was Ghost in the Shell: Stand Alone Complex 2nd GIG, which, particularly in the context above, is a series worth writing about. It aired back in 2004 and I’m not convinced the anime community understood just how good it had it with this show; Yoko Kanno’s wonderful score, Production I.G’s cinematic animation and Kenji Kamiyama’s ambitious direction. What a combination! The story is intellectual, exciting and emotional. Basically, it’s one of the finest series I’ve seen, and my only disappointment is that it took me this long to sit down and watch it! I held back precisely because I knew how serious and wordy any given episode of Stand Alone Complex can be. The dialogue flows thick and fast, loaded with technical terms and philosophical discussions; every moment requires your full, undivided attention, something I wasn’t willing to give it, for shame. Yet for all its high-mindedness, its characters are so empathetic. Thinking back on it, I immediately flashback to Section 9. 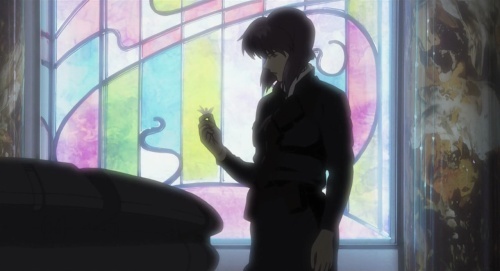 Batou’s devotion to Kusanagi; her nostalgic connection to Kuze; his many shades of grey; the paper cranes; Batou refusing to leave Kusanagi to die; their mission in Berlin. I won’t forget it. Over at AWESOME ENGINE, Brack is heroically sifting through a decades worth of anime, one series at a time. He began in 2000 and is gradually approaching the present day. It makes for fascinating reading, if just because it highlights the sheer bulk of anime that simply retreats into the shadows after a short-lived moment in the sun. Fandom can be so fickle! Mushishi was airing on Japanese TV at the same time as Mai-Otome; the latter seemed so popular at the time, but I would suggest that it’s now as good as forgotten, while Mushishi endures, consistently finding newer generations of anime fans. Well it’s not surprising that after years of watching anime even the good anime can feel a bit repetitive (it’s the same for me now). Gone are the days when anime was a new & exciting discovery. But you know I think this is a problem for pretty much every form of entertainment from live action TV, to film, to books, etc. I still think there is great things (old & new) out there to discover but you really have to dig. And sometimes it is okay & even fun to watch the “same old thing” again as well. And like Kim, I too wish Utena would’ve done better with 26 episodes. Still love it though. But the movie is better, my all time favourites. Indeed, it’s definitely not the case that anime is any worse now than it used to be, just that stuff becomes a little too predictable; the recent baseball match in Cross Game is a good example of that, it was great to watch, but that greatness was undercut slightly, if just because I could predict exactly what was going to happen next! So I guess finding anime that’s unique is often half the battle; the other is finding anime that’s empathetic. Quite often it’s one or the other, but in rare cases like Stand Alone Complex or Kaiba or Bebop or Mushishi we get the full package and suddenly it seems so clear what we’ve been missing all this time. Yeah, it’s telling that probably my favourite episodes of 2nd Gig were those that dealt with the more personal story-lines. Like the episode where Kusangi stumbles across that strange antique shop and reminisces about her past, or when Batou and Kusangi are pack-off to that mission in Berlin and Batou becomes fascinated by the girl. Those episodes are so good I’m willing to forgive Kamiyama’s relapses into talking-head syndrome! We’ll see; at least it’s different. I picking up a lot of Princess Tutu vibes in Utena, which can only be a good thing! The latter obviously had a huge influence in the creation of the former. I love it when shojo/magical girl anime suddenly gets all eccentric and creative, it seems to suit the genre so well. 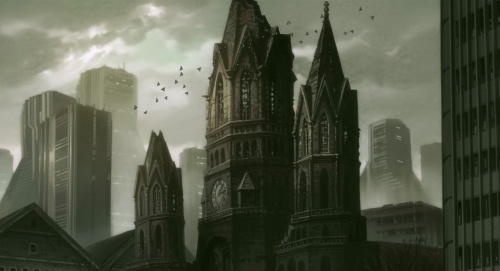 It’s interesting that you see this series as a contrast to other more rote shows because personally I’ve been putting off GITS 2nd gig (despite enjoying the first series a great deal) precisely because of a niggling feeling that I already know what its game is thematically – I keep hoping to find timelessness in new styles. Still, I really should take advantage of its wide availability and presumed excellence in due course. re. Utena I’d suggest that it’s one of those series whose stumbles are inseparable from the experience as a whole. In some way it benefits from its sprawl – the film, for example, is better managed storytelling, but I don’t think it has quite the same extraordinary feeling. Welcome back! It’s a wise move to opt for what inspires you to share your thoughts, even if it’s not a new show. The SAC for me is a rare and wonderful example of a grown-up animated series – just as entertaining and intelligent as the likes of 24 for instance (another political thriller that I’m currently and belatedly getting into). The backstories in the second season were excellent, but the quality of the writing in general was an improvement over the first. Impressive really, since I found even that to be outstanding. What I love most of all is the fact that the SAC is more accessible than the movies yet is impressive enough both artistically and thematically to hold its own, rather than being some inferior spin-off. I’ve always avoided Gits. I never liked my shows with much techno-babble, they tend to deviate into realms of nonsense. Empathetic characters and Yoko Kanno though? Wow have I really missed a show of such a caliber all these years? Sometimes Gits would find a way to me (through the movie, through the TV show) yet I would purposely shake it off and leave it for not. Maybe its time I sat down and watched me some Gits techno-babble style hehe. I seriously hope these shots you’ve taken are a good examples of the quality the show maintains threw out its run, not just moments of greatness. Timelessness in new styles is the general pattern I tend to follow too (for this current season, Trapeze is ticking a lot of those boxes) but there’s definitely something nice about anime as proficient and ‘solid’ as SAC; watching it is like wrapping yourself in a warm blanket! 🙂 There were several chilly evenings in October when I’d just totally relax with an episode of this in complete confidence that what I was about to see would be, at the very least, good. Heh, no worries, it’s always a relief to get some diverse opinions anyway. At the moment I’m enjoying it purely because it’s so unique and, well… weird. Hey dude! I remember you recommending 2nd Gig to me and I’m glad you did. It was awesome! And I hope all’s well with you, too; great to see you’re still hanging around the place and (presumably) still watching anime! A few years back I watched the first 15 eps or so of the first GITS season, but never finished it. I’ve generally heard better review for the 2nd season though, and have thought of picking it up. Do you guys think I need to finish the 1st season?? or can I just move in to the 2nd, and whatever changes that have occured will get explained organically?? I’ve also thought of watching some with my wife, but she’s never seen any of it (besides the original movie, years ago), and I don’t want to leave her confused. Sure, you can dive straight into 2nd Gig. You may need to be superficially familiar with the characters of Section 9, but there’s no story arcs or plot threads carried over from the 1st Gig; it’s a totally fresh start, and very easy to get back into the groove! Also, don’t be deterred by its rather complicated nature, SAC can be really confusing, but I promise it’s worth the struggle; some of the episodes in 2nd Gig are really outstanding. I’ve kind of fallen out of the blogsphere’s anime limbo. But no worries! I’m back! Although I was sure I wouldn’t be back after watching the terrific Clannad after story a few months back, but here I am :P. I guess my love for anime perseveres yet again. Right now though I’m not too thrilled to be back….one of my favorite directors Junichi Sato was hard at work on a new show, Umi Monogatari. You can imagine my expectations flying sky high and crashing the second those girls started speaking and their high squeaky voices. His magic..his undeniable touch….his burning spirit are just not there. So ya I’m sorely disappointed. But hey I’ve got FMA and the second season of DtB to tide me over till something extremely exceptional comes my way. So good to be back and I’m contradictory! It’s funny how things can work. You mentioned that finishing Clannad After Story affected you (in a good way, presumably?) so much that getting back into anime was difficult. I think I suffer from the same thing; I didn’t realize it at the time, but it probably took me a few months just to get over finishing Legend of the Galactic Heroes! Back to the topic at hand. Ghost in the Shell SAC series are both on my list of all-time favoutires, though I think I prefer the first. The main plot is capticating, surprisingly coherent and painfully realistic (and with that I mean the ending). Each and every episode is well thought out and enjoyable to watch. It’s detective story sci-fi at it’s best. The only thing the first season lacks is more character development. 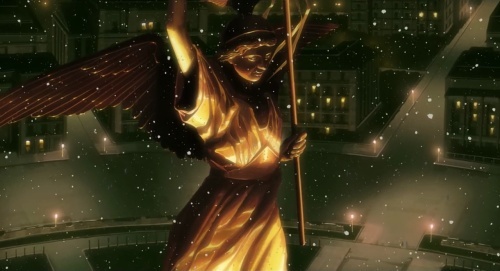 2nd GiG is, on the other hand, great when it comes to backstory of the main characters (though Pazu’s seemed a little bit over the top, as was Saito’s at one point). Finding out how Motoko came to be a cyborg was a blast. What disappointed me in the second installment was the main plot. Too many talking heads and utterly confusing/nonsensical moments kept me from fully appreciating the story. Still, a great anime, way above the level of the generic stuff getting released all the time. Heh 🙂 I never intend to disappear, it just… happens! Nice to see you back as well, Johny!